Fish are exposed to large oxygen fluctuations in their aquatic environment since the inherent properties of water can result in marked spatial and temporal differences in the concentration of oxygen (see oxygenation and underwater). Fish respond to hypoxia with varied behavioral, physiological, and cellular responses in order to maintain homeostasis and organism function in an oxygen-depleted environment. The biggest challenge fish face when exposed to low oxygen conditions is maintaining metabolic energy balance, as 95% of the oxygen consumed by fish is used for ATP production through the electron transport chain. Therefore, hypoxia survival requires a coordinated response to secure more oxygen from the depleted environment and counteract the metabolic consequences of decreased ATP production at the mitochondria. This article is a review of the effects of hypoxia on all aspects of fish, ranging from behavior down to genes. Hypoxia tolerance in fish can often be determined by assessing the value of critical O2 tension, often referred as Pcrit. Pcrit is a point where an oxy-regulator becomes an oxy-conformer. The oxygen consumption rate (MO2) of oxy-regulators are unaffected by the changes in environmental oxygen tension (PO2), whereas the MO2 of oxy-conformers are affected by the changes in PO2, showing decreased MO2 with decreasing PO2. Individuals with low Pcrit values are usually associated with high hypoxia tolerance while individuals with high Pcrit values tend to be more hypoxia sensitive. However, some species or individuals can be complete oxy-conformers and may not show distinctive Pcrit points. Therefore, experimentally defining hypoxia in such species can be difficult. In mammals there are several structures that have been implicated as oxygen sensing structures; however, all of these structures are situated to detect aortic or internal hypoxia since mammals rarely run into environmental hypoxia. These structures include the type I cells of the carotid body, the neuroepithelial bodies of the lungs as well as some central and peripheral neurons and vascular smooth muscle cells. In fish, the neuroepithelial cells (NEC) have been implicated as the major oxygen sensing cells. NEC have been found in all teleost fish studied to date, and are likely a highly conserved structure within many taxa of fish. NEC are also found in all four gill arches within several different structures, such as along the filaments, at the ends of the gill rakers and throughout the lamellae. Two separate neural pathways have been identified within the zebrafish gill arches both the motor and sensory nerve fibre pathways. Since neuroepithelial cells are distributed throughout the gills, they are often ideally situated to detect both arterial as well as environmental oxygen. Neuroepithelial cells (NEC) are thought to be neuron-like chemoreceptor cells because they rely on membrane potential changes for the release of neurotransmitters and signal transmission onto nearby cells. Once NEC of the zebrafish gills come in contact with either environmental or aortic hypoxia, an outward K+ "leak" channel is inhibited. It remains unclear how these K+ channels are inhibited by a shortage of oxygen because there are yet to be any known direct binding sites for "a lack of oxygen", only whole cell and ion channel responses to hypoxia. K+ "leak" channels are two-pore-domain ion channels that are open at the resting membrane potential of the cell and play a major role in setting the equilibrium resting membrane potential of the cell. Once this "leak" channel is closed, the K+ is no longer able to freely flow out of the cell, and the membrane potential of the NEC increases; the cell becomes depolarized. This depolarization causes voltage-gated Ca2+ channels to open, and for extracellular Ca2+ to flow down its concentration gradient into the cell causing the intracellular Ca2+ concentration to greatly increase. Once the Ca2+ is inside the cell, it binds to the vesicle release machinery and facilitates binding of the t-snare complex on the vesicle to the s-snare complex on the NEC cell membrane which initiates the release of neurotransmitters into the synaptic cleft. If the post-synaptic cell is a sensory neuron, then an increased firing rate in that neuron will transmit the signal to the central nervous system for integration. Whereas, if the post-synaptic cell is a connective pillar cell or a vascular smooth muscle cell, then the serotonin will cause vasoconstriction and previously unused lamellae will be recruited through recruitment of more capillary beds, and the total surface area for gas exchange per lamella will be increased. In fish, the hypoxic signal is carried up to the brain for processing by the glossopharyngeal (cranial nerve IX) and vagus (cranial nerve X) nerves. The first branchial arch is innervated by the glossopharyngeal nerve (cranial nerve IX); however all four arches are innervated by the vagus nerve (cranial nerve X). Both the glossopharyngeal and vagus nerves carry sensory nerve fibres into the brain and central nervous system. Through studies using mammalian model organisms, there are two main hypotheses for the location of oxygen sensing in chemoreceptor cells: the membrane hypothesis and the mitochondrial hypothesis. The membrane hypothesis was proposed for the carotid body in mice, and it predicts that oxygen sensing is an ion balance initiated process. The mitochondrial hypothesis was also proposed for the carotid body of mice, but it relies on the levels of oxidative phosphorylation and/or reactive oxygen species (ROS) production as a cue for hypoxia. Specifically, the oxygen sensitive K+ currents are inhibited by H2O2 and NADPH oxidase activation. There is evidence for both of these hypotheses depending on the species used for the study. For the neuroepithelial cells in the zebrafish gills, there is strong evidence supporting the "membrane hypothesis" due to their capacity to respond to hypoxia after removal of the contents of the cell. However, there is no evidence against multiple sites for oxygen sensing in organisms. Many hypoxic environments never reach the level of anoxia and most fish are able to cope with this stress using different physiological and behavioural strategies. Fish that use air breathing organs (ABO) tend to live in environments with highly variable oxygen content and rely on aerial respiration during times when there is not enough oxygen to support water-breathing. Though all teleosts have some form of swim bladder, many of them are not capable of breathing air, and they rely on aquatic surface respiration as a supply of more oxygenated water at the surface of the water. However, many species of teleost fish are obligate water breathers and do not display either of these surface respiratory behaviours. Typically, acute hypoxia causes hyperventilation, bradycardia and an elevation in gill vascular resistance in teleosts. However, the benefit of these changes in blood pressure to oxygen uptake has not been supported in a recent study of the rainbow trout. It is possible that the acute hypoxia response is simply a stress response, and the advantages found in early studies may only result after acclimatization to the environment. Hypoxia can modify normal behavior. Parental behaviour meant to provide oxygen to the eggs is often affected by hypoxia. For example, fanning behavior (swimming on the spot near the eggs to create a flow of water over them, and thus a constant supply of oxygen) is often increased when oxygen is less available. This has been documented in sticklebacks, gobies, and clownfishes, among others. Gobies may also increase the size of the openings in the nest they build, even though this may increase the risk of predation on the eggs. Rainbow cichlids often move their young fry closer to the water surface, where oxygen is more available, during hypoxic episodes. Behavioural adaptations meant to survive when oxygen is scarce include reduced activity levels, aquatic surface respiration, and air breathing. As oxygen levels decrease, fish may at first increase movements in an attempt to escape the hypoxic zone, but eventually they greatly reduce their activity levels, thus reducing their energetic (and therefore oxygen) demands. Atlantic herring show this exact pattern. Other examples of fishes that reduce their activity levels under hypoxia include the common sole, the guppy, the small-spotted catshark, and the viviparous eelpout. Some sharks that ram-ventilate their gills may understandably increase their swimming speeds under hypoxia, to bring more water to the gills. In response to decreasing dissolved oxygen level in the environment, fish swim up to the surface of the water column and ventilate at the top layer of the water where it contains relatively higher level of dissolved oxygen, a behavior called aquatic surface respiration (ASR). Oxygen diffuses into water from air and therefore the top layer of water in contact with air contains more oxygen. This is true only in stagnant water; in running water all layers are mixed together and oxygen levels are the same throughout the water column. One environment where ASR often takes place is tidepools, particularly at night. Separation from the sea at low tide means that water is not renewed, fish crowding within the pool means that oxygen is quickly depleted, and absence of light at night means that there is no photosynthesis to replenish the oxygen. Examples of tidepool species that perform ASR include the tidepool sculpin, Oligocottus maculosus, the three-spined stickleback, and the mummichog. But ASR is not limited to the intertidal environment. Most tropical and temperate fish species living in stagnant waters engage in ASR during hypoxia. One study looked at 26 species representing eight families of non-air breathing fishes from the North American great plains, and found that all but four of them performed ASR during hypoxia. Another study looked at 24 species of tropical fish common to the pet trade, from tetras to barbs to cichlids, and found that all of them performed ASR. An unusual situation in which ASR is performed is during winter, in lakes covered by ice, at the interface between water and ice or near air bubbles trapped underneath the ice. Some species may show morphological adaptations, such as a flat head and an upturned mouth, that allow them to perform ASR without breaking the water surface (which would make them more visible to aerial predators). One example is the mummichog, whose upturned mouth suggests surface feeding, but whose feeding habits are not particularly restricted to the surface. In the tambaqui, a South American species, exposure to hypoxia induces within hours the development of additional blood vessels inside the lower lip, enhancing its ability to take up oxygen during ASR. Swimming upside down may also help fishes perform ASR, as in some upside-down catfish. Some species may hold an air bubble within the mouth during ASR. This may assist buoyancy as well as increase the oxygen content of the water passing over the bubble on its way to the gills. Another way to reduce buoyancy costs is to perform ASR on rocks or plants that provide support near the water surface. ASR significantly affects survival of fish during severe hypoxia. In the shortfin molly for example, survival was approximately four times higher in individuals able to perform ASR as compared to fish not allowed to perform ASR during their exposure to extreme hypoxia. ASR may be performed more often when the need for oxygen is higher. In the sailfin molly, gestating females (this species is a livebearer) spend about 50% of their time in ASR as compared to only 15% in non-gestating females under the same low levels of oxygen. Aerial respiration is the ‘gulping’ of air at the surface of water to directly extract oxygen from the atmosphere. Aerial respiration evolved in fish that were exposed to more frequent hypoxia; also, species that engage in aerial respiration tend to be more hypoxia tolerant than those which do not air-breath during the hypoxia. There are two main types of air breathing fish—facultative and non-facultative. Under normoxic conditions facultative fish can survive without having to breathe air from the surface of the water. However, non-facultative fish must respire at the surface even in normal dissolved oxygen levels because their gills cannot extract enough oxygen from the water. Many air breathing freshwater teleosts use ABOs to effectively extract oxygen from air while maintaining functions of the gills. ABOs are modified gastrointestinal tracts, gas bladders, and labyrinth organs; they are highly vascularized and provide additional method of extracting oxygen from the air. Fish also use ABO for storing the retained oxygen. Both ASR and aerial respiration require fish to travel to the top of water column and this behaviour increases the predation risks by aerial predators or other piscivores inhabiting near the surface of the water. In order to cope with the increased predation risk upon surfacing, some fish perform ASR or aerial respiration in schools in order to ‘dilute’ the predation risk. When fish can visually detect the presence of their aerial predators, they simply refrain from surfacing, or prefer to surface in areas where they can be detected less easily (i.e. turbid, shaded areas). Gill remodelling happens in only a few species of fish, and it involves the buildup or removal of an inter-lamellar cell mass (ILCM). As a long term response to hypoxia, some fish are able to remodel their gills to increase the respiratory surface area. The increased respiratory surface area comes as a trade-off with increased metabolic costs because the gills are a very important site for many important processes including respiratory gas exchange, acid-base regulation, nitrogen excretion, osmoregulation, hormone regulation, metabolism, and environmental sensing. The crucian carp is one species able to remodel its gill filaments in response to hypoxia. Their inter-lamellar cells have high rates of mitotic activity which are influenced by both hypoxia and temperature. In cold (15 °C) water the crucian carp has more ILCM, but when the temperature is increased to 25 °C the ILCM is removed, just as it would be in hypoxic conditions. This same transition in gill morphology occurs in the goldfish when the temperature was raised from 7.5 °C to 15 °C. This difference may be due to the temperature regimes that these fish are typically found in, or there could be an underlying protective mechanism to prevent a loss of ion balance in stressful temperatures. Temperature also affects the speed at which the gills can be remodelled: for example, at 20 °C in hypoxia, the crucian carp can completely remove its ILCM in 6 hours, whereas at 8 °C, the same process takes 3–7 days. The ILCM is likely removed by apoptosis, but it is possible that when the fish is faced with the double stress of hypoxia at high temperature, the lamellae may be lost by physical degradation. Covering the gill lamellae may protect species like the crucian carp from parasites and environmental toxins during normoxia by limiting their surface area for inward diffusion while still maintaining oxygen transport due to an extremely high hemoglobin oxygen binding affinity. The naked carp, a closely related species native to the high-altitude Lake Qinghai, is also able to remodel their gills in response to hypoxic conditions. In response to oxygen levels 95% lower than normoxic conditions, apoptosis of ILCM increases lamellar surface area by up to 60% after just 24 hours. However, this comes at a significant osmoregulatory cost, reducing sodium and chloride levels in the cytoplasm by over 10%. The morphological response to hypoxia by scaleless carp is the fastest respiratory surface remodelling reported in vertebrates thus far. Fish exhibit a wide range of tactics to counteract aquatic hypoxia, but when escape from the hypoxic stress is not possible, maintaining oxygen extraction and delivery becomes an essential component to survival. Except for the Antarctic ice fish that does not, most fish use hemoglobin (Hb) within their red blood cells to bind chemically and deliver 95% of the oxygen extracted from the environment to the working tissues. Maintaining oxygen extraction and delivery to the tissues allows continued activity under hypoxic stress and is in part determined by modifications in two different blood parameters: hematocrit and the binding properties of hemoglobin. In general, hematocrit is the number of red blood cells (RBC) in circulation and is highly variable among fish species. Active fish, like the blue marlin, tend to have higher hematocrits, whereas less active fish, such as the starry flounder exhibit lower hematocrits. Hematocrit may be increased in response to both short-term (acute) or long-term (chronic) hypoxia exposure and results in an increase in the total amount of oxygen the blood can carry, also known as the oxygen carrying capacity of the blood. Acute changes in hematocrit are the result of circulating stress hormones (see - catecholamines) activating receptors on the spleen that cause the release of RBCs into circulation. During chronic hypoxia exposure, the mechanism used to increase hematocrit is independent of the spleen and results from hormonal stimulation of the kidney by erythropoetin (EPO). Increasing hematocrit in response to erythropoietin is observed after approximately one week and is therefore likely under genetic control of hypoxia inducible factor hypoxia inducible factor (HIF). While increasing hematocrit means that the blood can carry a larger total amount of oxygen, a possible advantage during hypoxia, increasing the number of RBCs in the blood can also lead to certain disadvantages. First, A higher hematocrit results in more viscous blood (especially in cold water) increasing the amount of energy the cardiac system requires to pump the blood through the system and secondly depending on the transit time of the blood across the branchial arch and the diffusion rate of oxygen, an increased hematocrit may result in less efficient transfer of oxygen from the environment to the blood. An alternative mechanism to preserve O2 delivery in the face of low ambient oxygen is to increase the affinity of the blood. 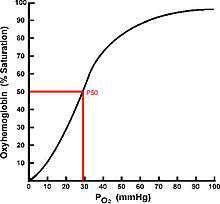 The oxygen content of the blood is related to PaO2 and is illustrated using an oxygen equilibrium curve (OEC). Fish hemoglobins, with the exception of the agnathans, are tetramers that exhibit cooperativity of O2 binding and have sigmoidal OECs. movement, the osmolarity of the RBC increases causing osmotic influx of water and cell swelling. The dilution of the cell contents causes further spatial separation of hemoglobin from the inorganic phosphates and again serves to increase Hb-O2 affinity. Nearly all animals have more than one kind of Hb present in the RBC. Multiple Hb isoforms (see isoforms) are particularly common in ectotherms, but especially in fish that are required to cope with both fluctutating temperature and oxygen availability. Hbs isolated from the European eel can be separated into anodic and cathodic isoforms. The anodic isoforms have low oxygen affinities (high P50) and marked Bohr effects, while the cathodic lack significant pH effects and are therefore thought to confer hypoxia tolerance. Several species of African cichlids raised from early stage development under either hypoxic or normoxic conditions were contrasted in an attempt to compare Hb isoforms. They demonstrated there were Hb isoforms specific to the hypoxia-raised individuals. To deal with decreased ATP production through the electron transport chain, fish must activate anaerobic means of energy production (see anaerobic metabolism) while suppressing metabolic demands. The ability to decrease energy demand by metabolic suppression is essential to ensure hypoxic survival due to the limited efficiency of anaerobic ATP production. Aerobic respiration, in which oxygen is used as the terminal electron acceptor, is crucial to all water-breathing fish. When fish are deprived of oxygen, they require other ways to produce ATP. Thus, a switch from aerobic metabolism to anaerobic metabolism occurs at the onset of hypoxia. Glycolysis and substrate-level phosphorylation are used as alternative pathways for ATP production. However, these pathways are much less efficient than aerobic metabolism. For example, when using the same substrate, the total yield of ATP in anaerobic metabolism is 15 times lower than in aerobic metabolism. This level of ATP production is not sufficient to maintain a high metabolic rate, therefore, the only survival strategy for fish is to alter their metabolic demands. The first response will shorten lifespan as there will be insufficient amounts of ATP to meet the high metabolic demands. The second response will prolong survival as they will be able to generate enough cellular energy to maintain a suppressed metabolic rate. As high as a 70% decrease in metabolic rate has been identified in some extremely hypoxia-tolerant fish such as goldfish, tilapia, and European eel. Although it is known that hypoxia-tolerant fish suppress their metabolism during hypoxia, the exact mechanisms to how this occurs is unclear. It is still unknown whether fish reduce ATP demand, increase ATP supply, or both. However, there is emerging evidence to support a decrease in ATP demand in response to hypoxia. The two most energetically expensive processes in a cell are protein turnover, which accounts for 55% of ATP utilization, and ion channel maintenance, which accounts for 25% of ATP utilization. In hypoxia-tolerant fish, the rate of protein synthesis is reduced in order to conserve ATP. The first prediction holds true. When membrane permeability to Na+ and K+ ions was compared between reptiles and mammals, reptile membranes were discovered to be five times less leaky. The second prediction has been more difficult to prove experimentally, however, indirect measures have showed a decrease in Na+/K+-ATPase activity in eel and trout hepatocytes during hypoxic conditions. Results seem to be tissue-specific, as crucian carp exposed to hypoxia do not undergo a reduction in Na+/K+ ATPase activity in their brain. Although evidence is limited, ion channel arrest enables organisms to maintain ion channel concentration gradients and membrane potentials without consuming large amounts of ATP. The limiting factor for fish undergoing hypoxia is the availability of fermentable substrate for anaerobic metabolism; once substrate runs out, ATP production ceases. Endogenous glycogen is present in tissue as a long term energy storage molecule. It can be converted into glucose and subsequently used as the starting material in glycolysis. A key adaptation to long-term survival during hypoxia is the ability of an organism to store large amounts of glycogen. Many hypoxia-tolerant species, such as carp, goldfish, killifish, and oscar contain the largest glycogen content (300-2000 µmol glocosyl units/g) in their tissue compared to hypoxia-sensitive fish, such as rainbow trout, which contain only 100 µmol glocosyl units/g. The more glycogen stored in a tissue indicates the capacity for that tissue to undergo glycolysis and produce ATP. When anaerobic pathways are turned on, glycogen stores are depleted and accumulation of acidic waste products occurs. This is known as a Pasteur effect. A challenge hypoxia-tolerant fish face is how to produce ATP anaerobically without creating a significant Pasteur effect. Along with a reduction in metabolism, some fish have adapted traits to avoid accumulation of lactate. For example the crucian carp, a highly hypoxia-tolerant fish, has evolved to survive months of anoxic waters. A key adaptation is the ability to convert lactate to ethanol in the muscle and excrete it out of their gills. Although this process is energetically costly is it crucial to their survival in hypoxic waters. DNA microarray studies done on different fish species exposed to low-oxygen conditions have shown that at the genetic level fish respond to hypoxia by changing the expression of genes involved in oxygen transport, ATP production, and protein synthesis. In the liver of mudsuckers exposed to hypoxia there were changes in the expression of genes involved in heme metabolism such as hemopexin, heme oxygenase 1, and ferritin. Changes in the sequestration and metabolism of iron may suggest hypoxia induced erythropoiesis and increased demand for hemoglobin synthesis, leading to increased oxygen uptake and transport. Increased expression of myoglobin, which is normally only found in muscle tissue, has also been observed after hypoxia exposure in the gills of zebrafish and in non-muscle tissue of the common carp suggesting increased oxygen transport throughout fish tissues. Microarray studies done on fish species exposed to hypoxia typically show a metabolic switch, that is, a decrease in the expression of genes involved in aerobic metabolism and an increase in expression of genes involved in anaerobic metabolism. Zebrafish embryos exposed to hypoxia decreased expression of genes involved in the citric acid cycle including, succinate dehydrogenase, malate dehydrogenase, and citrate synthase, and increased expression of genes involved in glycolysis such as phosphoglycerate mutase, enolase, aldolase, and lactate dehydrogenase. A decrease in protein synthesis is an important response to hypoxia in order to decrease ATP demand for whole organism metabolic suppression. Decreases in the expression of genes involved in protein synthesis, such as elongation factor-2 and several ribosomal proteins, have been shown in the muscle of the mudsucker and gills of adult zebrafish after hypoxia exposure . Research in mammals has implicated hypoxia inducible factor (HIF) as a key regulator of gene expression changes in response to hypoxia However, a direct link between fish HIFs and gene expression changes in response to hypoxia has yet to be found. Phylogenetic analysis of available fish, tetrapod, and bird HIF-α and -β sequences shows that the isoforms of both subunits present in mammals are also represented in fish Within fish, HIF sequences group close together and are distinct from tetrapod and bird sequences. As well, amino acid analysis of available fish HIF-α and -β sequences reveals that they contain all functional domains shown to be important for mammalian HIF function, including the basic helix-loop-helix (bHLH) domain, Per-ARNT-Sim (PAS) domain, and the oxygen-dependent degradation domain (ODD), which render the HIF-α subunit sensitive to oxygen levels. The evolutionary similarity between HIF sequences in fish, tetrapods and birds, as well as the conservation of important functional domains suggests that HIF function and regulation is similar between fish and mammalian species. There is also evidence of novel HIF mechanisms present in fish not found in mammals. In mammals, HIF-α protein is continuously synthesized and regulated post-translationally by changing oxygen conditions, but it has been shown in different fish species that HIF-α mRNA levels are also responsive to hypoxia. In the hypoxia tolerant grass carp, substantial increases in HIF-1α and HIF-3α mRNA were observed in all tissues after hypoxia exposure. Likewise, mRNA levels of HIF-1α and HIF-2α were hypoxia-responsive in the ovaries of the Atlantic croaker during both short and long term hypoxia. 1 2 3 Richards JG. 2009. Metabolic and molecular responses of fish to hypoxia. In Hypoxia, Vol. 27 (ed. Richards JG, Farrell AP, Brauner CJ), pp. 443-485. San Diego: Elsevier. 1 2 3 Richards, JG (2011). "Physiological, behavioral and biochemical adaptations of intertidal fishes to hypoxia". J Exp Biol. 214 (Pt 2): 191–199. doi:10.1242/jeb.047951. PMID 21177940. ↑ Gonzalez, C; Almaraz, L; Obeso, A; Rigual, R (1994). "Carotid body chemoreceptors: from natural stimuli to sensory discharges". Physiol Rev. 74 (4): 829–898. PMID 7938227. ↑ Fu, XW; Nurse, CA; Wong, V; Cutz, E (2002). "Hypoxia-induced secretion of serotonin from intact pulmonary neuroepithelial bodies in neonatal rabbit". J Physiol. 539 (Pt 2): 503–510. doi:10.1113/jphysiol.2001.013071. PMC 2290169 . PMID 11882682. ↑ Jonz, MG; Fearon, IM; Nurse, CA (2004). "Neuroepithelial oxygen chemoreceptors of the zebrafish gill". J Physiol. 560 (Pt 3): 737–752. doi:10.1113/jphysiol.2004.069294. PMC 1665292 . PMID 15331683. ↑ Jonz, MG; Nurse, CA (2003). "Neuroepithelial cells and associated innervation of the zebrafish gill: A confocal immunofluorescence study". J Comp Neurol. 461 (1): 1–17. doi:10.1002/cne.10680. PMID 12722101. ↑ Coolidge, EH; Ciuhandu, CC; Milsom, WK (2008). "A comparative analysis of putative oxygen sensing cells in the fish gill". J Exp Biol. 211 (Pt 8): 1231–1242. doi:10.1242/jeb.015248. PMID 18375847. ↑ Lesage, F; Lazdunski, M (2000). "Molecular and functional properties of two-pore-domain potassium channels". Am J Physiol. 279 (5): F793–F801. PMID 11053038. ↑ Farrell, AP; Daxboeck, C; Randall, DJ (1979). "The effect of input pressure and flow on the pattern and resistance to flow in the isolated perfused gill of a teleost fish". J Comp Physiol. 133 (3): 233–240. doi:10.1007/BF00691471. ↑ Lopez-Barneo, J; Lopez-Lopez, JR; Urena, J; Gonzalez, C (1988). "Chemotransduction in the carotid body: K+ current modulated by PO2 in type I chemoreceptor cells". Science. 241 (4865): 580–582. doi:10.1126/science.2456613. PMID 2456613. ↑ Fu, XW; Wang, D; Nurse, CA; Dinauer, MC; Cutz, E (2000). "NADPH oxidase is an O2 sensor in airway chemoreceptors: Evidence from K+ current modulation in wild-type and oxidase-deficient mice". Proc Natl Acad Sci USA. 97 (8): 4374–4379. doi:10.1073/pnas.97.8.4374. PMC 18249 . PMID 10760304. ↑ Holeton, GF; Randall, DJ (1967). "Changes in blood pressure in the rainbow trout during hypoxia". J Exp Biol. 46 (2): 297–305. PMID 6033996. ↑ Iersel, J.J.A. van. 1953. An analysis of the parental behaviour of the male three-spine stickleback (Gasterosteus aculeatus L.). Behaviour Supplement 3: 1-159. ↑ Sevenster, P. 1961. A causal analysis of a displacement activity (fanning in Gasterosteus aculeatus L.). Behaviour Supplement 9: 1-170. ↑ Torricelli, P.; Lugli, M.; Gandolfi, G. (1985). "A quantitative analysis of the fanning activity in the male Padogobius martensi (Pisces: Gobiidae)". Behaviour. 92: 288–301. JSTOR 4534416. ↑ Takegaki, T.; Nakazono, A. (1999). "Responses of the egg-tending gobiid fish Valenciennea longipinnis to the fluctuation of dissolved oxygen in the burrow". Bulletin of Marine Science. 65: 815–823. ↑ Green, B.S. ; McCormick, M.I. (2005). "O2 replenishment to fish nests: males adjust brood care to ambient conditions and brood development". Behavioral Ecology. 16 (2): 389–397. doi:10.1093/beheco/ari007. ↑ Jones, J.C.; Reynolds, J.D. (1999). "Oxygen and the trade-off between egg ventilation and brood protection in the common goby". Behaviour. 136: 819–832. doi:10.1163/156853999501586. ↑ Jones, J.C.; Reynolds, J.D. (1999). "The influence of oxygen stress on female choice for male nest structure in the common goby". Animal Behaviour. 57 (1): 189–196. doi:10.1006/anbe.1998.0940. ↑ Courtenay, S.C.; Keenleyside, M.H.A. (1983). "Wriggler-hanging: a response to hypoxia by brood-rearing Herotilapia multispinosa (Teleostei, Cichlidae)". Behaviour. 85: 183–197. doi:10.1163/156853983x00219. ↑ Domenici, P.; Steffensen, J.F. ; Batty, R.S. (2000). "The effect of progressive hypoxia on swimming activity and schooling in Atlantic herring". Journal of Fish Biology. 57: 1526–1538. doi:10.1006/jfbi.2000.1413. ↑ Dalla Via, D.; Van; den Thillart, G.; Cattani, O.; Cortesi, P. (1998). "Behavioural responses and biochemical correlates in Solea solea to gradual hypoxic exposure". Canadian Journal of Zoology. 76 (11): 2108–2113. doi:10.1139/z98-141. ↑ Kramer, D.L. ; Mehegan, J.P. (1981). "Aquatic surface respiration, an adaptive response to hypoxia in the guppy, Poecilia reticulata (Pisces, Poeciliidae)". Environmental Biology of Fishes. 6: 299–313. doi:10.1007/bf00005759. ↑ Metcalfe, J.D. ; Butler, P.J. (1984). "Changes in activity and ventilation in response to hypoxia in unrestrained, unoperated dogfish (Scyliorhinus canicula L.)". Journal of Experimental Biology. 180: 153–162. ↑ Fisher, P.; Rademacher, K.; Kils, U. (1992). "In situ investigations on the respiration and behaviour of the eelpout Zoarces viviparus under short-terms hypoxia". Marine Ecology Progress Series. 88: 181–184. doi:10.3354/meps088181. ↑ Carlson, J.K.; Parsons, G.R. (2001). "The effects of hypoxia on three sympatric shark species: physiological and behavioral responses". Environmental Biology of Fishes. 61: 427–433. doi:10.1023/a:1011641302048. ↑ Kramer, D.L. (1987). "Dissolved oxygen and fish behavior". Environmental Biology of Fishes. 18: 81–92. doi:10.1007/bf00002597. ↑ Congleton, J.L. (1980). "Observations of the responses of some southern California tidepool fishes to nocturnal hypoxic stress". Comparative Biochemistry and Physiology A. 66: 719–722. doi:10.1016/0300-9629(80)90026-2. ↑ Sloman, K.A. ; Mandic, M.M. ; Todgham, A.E. ; et al. (2008). "The response of the tidepool sculpin, Oligocottus maculosus, to hypoxia in laboratory, mecocosm and field environments". Comparative Biochemistry and Physiology A. 149: 284–292. doi:10.1016/j.cbpa.2008.01.004. ↑ Mandic, M; Sloman, KA Richards JG (2009). 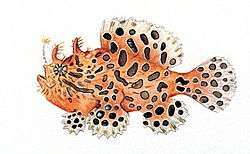 "Escaping to the surface: a phylogenetically independent analysis of hypoxia-induced respiratory behaviors in sculpins". Physiol Biochem Zool. 82 (6): 703–738. doi:10.1086/605932. PMID 19799503. ↑ Reebs, S.G.; Whoriskey, F.G.; FitzGerald, G.J. (1984). "Diel patterns of fanning activity, egg respiration, and the nocturnal behavior of male three spined sticklebacks, Gasterosteus aculeatus L. (f. trachurus)". Canadian Journal of Zoology. 62 (329): 334. doi:10.1139/z84-051. ↑ Wannamaker, C.M. ; Rice, J.A. (2000). "Effects of hypoxia on movements and behavior of selected estuarine organisms from the southeastern United States". Journal of Experimental Marine Biology and Ecology. 249: 145–163. doi:10.1016/s0022-0981(00)00160-x. ↑ Stierhoff, K.L. ; Targett, T.E. ; Grecay, P.A. (2003). "Hypoxia tolerance of the mummichog: the role of access to the water surface". Journal of Fish Biology. 63: 580–592. doi:10.1046/j.1095-8649.2003.00172.x. ↑ Gee, J.H. ; Tallman, R.F. ; Smart, H.J. (1978). "Reactions of some great plains fishes to progressive hypoxia". Canadian Journal of Zoology. 56 (9): 1962–1966. doi:10.1139/z78-263. ↑ Kramer, D.L. ; McClure, M. (1982). "Aquatic surface respiration, a widespread adaptation to hypoxia in tropical freshwater fishes". Environmental Biology of Fishes. 7: 47–55. doi:10.1007/bf00011822. ↑ Klinger, S.A.; Magnuson, J.J.; Gallepp, G.W. (1982). "Survival mechanisms of the central mudminnow (Umbra limi), fathead minnow (Pimephales promelas) and brook stickleback (Culaea inconstans) for low oxygen in winter". Environmental Biology of Fishes. 7: 113–120. doi:10.1007/bf00001781. ↑ Magnuson, J.J.; Beckel, A.L. ; Mills, K.; Brandt, S.B. (1985). "Surviving winter hypoxia: behavioral adaptations of fishes in a northern Wisconsin winterkill lake". Environmental Biology of Fishes. 14: 241–250. doi:10.1007/bf00002627. ↑ Petrosky, B.R. ; Magnuson, J.J. (1973). "Behavioral responses of Northern pike, yellow perch and bluegill to oxygen concentrations under simulated winterkill conditions". Copeia. 1973: 124–133. doi:10.2307/1442367. ↑ Lewis, W.M. Jr (1970). "Morphological adaptations of cyprinodontoids for inhabiting oxygen deficient waters". Copeia. 1970: 319–326. doi:10.2307/1441653. ↑ Sundin, L.; Reid, S.G.; Rantin, F.T. ; Milson, W.K. (2000). "Branchial receptors and cardiorespiratory reflexes in a neotropical fish, the tambaqui (Colossoma macropomum)". Journal of Experimental Biology. 203: 1225–1239. ↑ Chapman, L.J. ; Kaufman, L.; Chapman, C.A. (1994). "Why swim upside down? A comparative study of two mochokid catfishes". Copeia. 1994: 130–135. doi:10.2307/1446679. ↑ Gee, J.H. ; Gee, P.A. (1991). "Reaction of gobioid fishes to hypoxia: buoyancy control and aquatic surface respiration". Copeia. 1991: 17–28. doi:10.2307/1446244. ↑ Timmerman, C.M. ; Chapman, L.J. (2003). "The effect of gestational state on oxygen consumption and response to hypoxia in the sailfin molly, Poecilia latipinna". Environmental Biology of Fishes. 68: 293–299. doi:10.1023/a:1027300701599. 1 2 Sloman, KA; Sloman, RD; De Boeck, G; Scott, GR; Iftikar, FI; Wood, CM; Almeida-Val, VMF (2009). "The role of size in synchronous air breathing of Hoplosternum littorale". Physiol biol zool. 82 (6): 625–34. doi:10.1086/605936. PMID 19799504. 1 2 Richards JG. 2009. Behavioral responses and ecological consequneces. In Hypoxia, Vol. 27 (ed. Richards JG, Farrell AP, Brauner CJ), pp. 25-77. San Diego: Elsevier. ↑ Domenici, P; Lefrançois, C; Shingles, A (2007). "Hypoxia and the antipredator behaviours of fishes". Philos T Roy Soc B. 362 (1487): 2105–2121. doi:10.1098/rstb.2007.2103. PMC 2442856 . PMID 17472921. ↑ Shingles, A.; McKenzie, D.J. ; Claireaux, G.; Domenici, P. (2005). "Reflex cardioventilatory responses to hypoxia in the flathead grey mulet (Mugil cephalus) and their behavioural modulation by perceived threat of predation and water turbidity". Physiological and Biochemical Zoology. 78: 744–755. doi:10.1086/432143. ↑ Evans, DH; Piermarini, PM; Choe, KP (January 2005). "The multifunctional fish gill: dominant site of gas exchange, osmoregulation, acid-base regulation, and excretion of nitrogenous waste". Physiological Reviews. 85 (1): 97–177. doi:10.1152/physrev.00050.2003. PMID 15618479. 1 2 3 Sollid, J; De Angelis, P; Gundersen, K; Nilsson, GE (October 2003). "Hypoxia induces adaptive and reversible gross morphological changes in crucian carp gills". J. Exp. Biol. 206 (Pt 20): 3667–73. doi:10.1242/jeb.00594. PMID 12966058. ↑ Sollid, J; Weber, RE; Nilsson, GE (March 2005). "Temperature alters the respiratory surface area of crucian carp Carassius carassius and goldfish Carassius auratus". Journal of Experimental Biology. 208 (Pt 6): 1109–16. doi:10.1242/jeb.01505. PMID 15767311. 1 2 Matey, V.; Richards, J. G.; Wang, Y.; Wood, C. M.; Rogers, J.; Davies, R.; Murray, B. W.; Chen, X.-Q. ; Du, J.; Brauner, C. J. (1 April 2008). "The effect of hypoxia on gill morphology and ionoregulatory status in the Lake Qinghai scaleless carp, Gymnocypris przewalskii". Journal of Experimental Biology. 211 (7): 1063–1074. doi:10.1242/jeb.010181. PMID 18344480. ↑ Cao, Yi-Bin; Chen, Xue-Qun; Wang, Shen; Wang, Yu-Xiang; Du, Ji-Zeng (22 October 2008). "Evolution and Regulation of the Downstream Gene of Hypoxia-Inducible Factor-1α in Naked Carp (Gymnocypris przewalskii) from Lake Qinghai, China". Journal of Molecular Evolution. 67 (5): 570–580. doi:10.1007/s00239-008-9175-4. PMID 18941827. 1 2 3 4 Perry, SF, Esbaugh, A, Braun, M, and Gilmour, KM. 2009. Gas Transport and Gill Function in Water Breathing Fish. In Cardio-Respiratory Control in Vertebrates, (ed. Glass ML, Wood SC), pp. 5-35. Berlin: Springer-Verlag. ↑ Wood, CM; Mcdonald, DG; Mcmahon, BR (1982). "The influence of experimental anemia on blood acid-base regulation in vivo and in vitro in the starry flounder (Platichthys stellatus) and rainbow trout (Salmo gairdneri)". J Exp Biol. 96: 221–237. ↑ Yamamoto, K.; Itazawa, Y.; Kobayashi, H. (1985). "Direct observations of fish spleen by an abdominal window method and its application to exercised and hypoxic yellowtail". Jpn J. Ichthyol. 31: 427–433. ↑ Lai, JC; Kakuta, I; Mok, HO; Rummer, JL; Randall, D (July 2006). "Effects of moderate and substantial hypoxia on erythropoietin levels in rainbow trout kidney and spleen". Journal of Experimental Biology. 209 (Pt 14): 2734–8. doi:10.1242/jeb.02279. PMID 16809464. ↑ Semenza, GL (2004). "O2-regulated gene expression: transcriptional control of cardiorespiratory physiology by HIF-1". J Appl Physiol. 96 (3): 1173–1177. doi:10.1152/japplphysiol.00770.2003. PMID 14766767. ↑ Powers, Dennis A (1980). "Molecular Ecology of Teleost Fish Hemoglobins Strategies for Adapting to Changing Environments". Integrative and Comparative Biology. 20 (1): 139–162. doi:10.1093/icb/20.1.139. ↑ Borgese, F; Garcia-Romeu, F; Motais, R (January 1987). "Control of cell volume and ion transport by beta-adrenergic catecholamines in erythrocytes of rainbow trout, Salmo gairdneri". J. Physiol. (Lond.). 382: 123–44. doi:10.1113/jphysiol.1987.sp016359. PMC 1183016 . PMID 3040965. ↑ Nikinmaa, M; Boutilier, RG (1995). "Adrenergic control of red cell pH, organic phosphate concentrations and haemoglobin function in teleost fish". In Heisler, N. Advances in Comparative and Environmental Physiology. 21. Berlin: Springer-Verlag. pp. 107–133. ↑ Tamburrini, M; Verde, C; Olianas, A; Giardina, B; Corda, M; Sanna, MT; Fais, A; Deiana, AM; Prisco, G; Pellegrini, M (2001). "The hemoglobin system of the brown moray Gymnothorax unicolor: Structure/function relationships". Eur. J. Biochem. 268 (14): 4104–4111. doi:10.1046/j.1432-1327.2001.02333.x. PMID 11454005. ↑ Rutjes, HA; Nieveen, MC; Weber, RE; Witte, F; Van; den Thillart, GE (September 2007). "Multiple strategies of Lake Victoria cichlids to cope with lifelong hypoxia include hemoglobin switching". AJP: Regulatory, Integrative and Comparative Physiology. 293 (3): R1376–83. doi:10.1152/ajpregu.00536.2006. PMID 17626121. ↑ Abbaraju, NV; Rees, BB (June 2012). "Effects of dissolved oxygen on glycolytic enzyme specific activities in liver and skeletal muscle of Fundulus heteroclitus". Fish Physiology and Biochemistry. 38 (3): 615–24. doi:10.1007/s10695-011-9542-8. PMID 21818543. ↑ Jibb, L. A.; Richards, J. G. (2008). "AMP-activated protein kinase activity during metabolic rate depression in the hypoxic goldfish, Carassius auratus". J. Exp. Biol. 211 (Pt 19): 3111–3122. doi:10.1242/jeb.019117. PMID 18805810. ↑ Lewis, J. M.; Costa, I.; Val, A. L.; Val, V. M. Almeida; Gamperi, A. K.; Driedzic, W. R. (2007). "Responses to hypoxia recovery: Repayment of oxygen debt is not associated with compensatory protein synthesis in the Amazonian cichlid, Astronotus ocellatus". J. Exp. Biol. 210 (Pt 11): 1935–1943. doi:10.1242/jeb.005371. PMID 17515419. ↑ Smith, RW; Houlihan, DF; Nilsson, GE; Brechin, JG (October 1996). "Tissue-specific changes in protein synthesis rates in vivo during anoxia in crucian carp". Am. J. Physiol. 271 (4 Pt 2): R897–904. PMID 8897979. ↑ Buck, L. T.; Hochachka, P. W. (1993). "Anoxic suppression of Na+/K+-ATPase and constant membrane potential in hepatocytes: support for channel arrest". Am. J. Physiol. 265: R1020–R1025. PMID 8238602. ↑ Else, PL; Hulbert, AJ (July 1987). "Evolution of mammalian endothermic metabolism: "leaky" membranes as a source of heat". Am. J. Physiol. 253 (1 Pt 2): R1–7. PMID 3605374. ↑ Busk, M; Boutilier, RG (2005). "Metabolic arrest and its regulation in anoxic eel hepatocytes". Physiological and Biochemical Zoology. 78 (6): 926–36. doi:10.1086/432857. PMID 16228932. ↑ Bogdanova, A.; Grenacher, B.; Nikinmaa, M.; Gassmann, M. (2005). "Hypoxic responses of Na +/K+ ATPase in trout hepatocytes". J. Exp. Biol. 208 (Pt 10): 1793–1801. doi:10.1242/jeb.01572. PMID 15879061. ↑ Hylland, P.; Milton, S.; Pek, M.; Nilsson, G. E.; Lutz, P. L. (1997). "Brain Na+/K+-ATPase activity in two anoxia tolerant vertebrates: Crucian carp and freshwater turtle". Neurosci. Lett. 235: 89–92. doi:10.1016/s0304-3940(97)00727-1. PMID 9389603. ↑ Vornanen, M., J. A. W. Stecyk, and G. Nilsson. 2009. The anoxia-tolerant crucian carp (Carassius carassius L.). In Hypoxia (ed. J. G. Richards, A. P. Farrell and C. J. Brauner), pp. 397-441. San Diego: Elsevier. 1 2 Gracey, AY; Troll, JV; Somero, GN (2001). "Hypoxia-induced gene expression profiling in the euryoxic fish Gillichthys mirabilis". Proc Natl Acad Sci USA. 98 (4): 1993–1998. doi:10.1073/pnas.98.4.1993. PMC 29370 . PMID 11172064. ↑ Fraser, J; de Mello, LV; Ward, D; Rees, HH; Williams, DR; Fang, YC; Brass, A; Gracey, AY; Cossins, AR (2006). "Hypoxia-inducible myoglobin expression in non-muscle tissues". Proc Natl Acad Sci USA. 103 (8): 2977–2981. doi:10.1073/pnas.0508270103. PMC 1413783 . PMID 16469844. ↑ Ton, C; Stamatiou, D; Liew, CC (April 2003). "Gene expression profile of zebrafish exposed to hypoxia during development". Physiological Genomics. 13 (2): 97–106. doi:10.1152/physiolgenomics.00128.2002. PMID 12700360. 1 2 Nikinmaa, M; Rees, BB (May 2005). "Oxygen-dependent gene expression in fishes". AJP: Regulatory, Integrative and Comparative Physiology. 288 (5): R1079–90. doi:10.1152/ajpregu.00626.2004. PMID 15821280. ↑ Kenneth, NS; Rocha, S (2008). "Regulation of gene expression by hypoxia". Biochem J. 414 (1): 19–29. doi:10.1042/BJ20081055. PMID 18651837. ↑ Law, SH; Wu, RS; Ng, PK; Yu, RM; Kong, RY (2006). "Cloning and expression analysis of two distinct HIF-alpha isoforms--gcHIF-1alpha and gcHIF-4alpha--from the hypoxia-tolerant grass carp, Ctenopharyngodon idellus". BMC Molecular Biology. 7 (1): 15. doi:10.1186/1471-2199-7-15. PMC 1473195 . PMID 16623959.